TORONTO, ON / ACCESSWIRE / October 15, 2018 / Intellipharmaceutics International Inc. (NASDAQ: IPCI; TSX: IPCI) ("Intellipharmaceutics" or the "Company"), a pharmaceutical company specializing in the research, development and manufacture of novel and generic controlled-release and targeted-release oral solid dosage drugs, today reported the results of operations for the three and nine months ended August 31, 2018. All dollar amounts referenced herein are in United States dollars unless otherwise noted. "We made great progress with respect to our development programs in the third quarter, despite challenging financial circumstances," said Dr. Isa Odidi, CEO of Intellipharmaceutics. "We recently completed the clinical portion of our human abuse liability studies and we remain on track with respect to our planned timeline for resubmission of our New Drug Application ('NDA'). Upon closing our offering, which is scheduled to occur on or about October 16, 2018 (subject to the satisfaction of customary closing conditions), we expect to have sufficient capital to significantly advance our Oxycodone ER and other 505(b)(2) development programs." In October 2018, we entered into an Underwriting Agreement (the "Underwriting Agreement") with H.C. Wainwright & Co., LLC ("H.C. Wainwright"), pursuant to which we agreed to issue and sell, in an underwritten public offering (the "October 2018 Offering"), 827,970 common shares and an aggregate of 16,563,335 pre-funded warrants ("Pre-Funded Warrants") exercisable into an aggregate of 16,563,335 common shares (the "Warrant Shares") together with common share purchase warrants to purchase up to an aggregate of 17,391,305 common shares ("Firm Warrants"). We also granted H.C. Wainwright an option to purchase up to 2,608,695 additional common shares and/or additional warrants to purchase up to 2,608,695 additional common shares at a purchase price of $0.75 each, less the underwriting discount, to cover over-allotments (if any). The common shares are being offered and sold to purchasers in units ("Units"), each of which includes one common share and one Firm Warrant, and the Pre-Funded Warrants are being offered and sold to purchasers in units ("Pre-Funded Units"), each of which includes one Pre-Funded Warrant and one Firm Warrant. The offering price is $0.75 per Unit and $0.74 per Pre-Funded Unit. Each Firm Warrant will be exercisable for one common share immediately upon the closing of the offering at a price of $0.75 per common share, subject to adjustment in certain circumstances, and will expire five years from the date of issuance. Each Pre-Funded Warrant will be immediately exercisable for one common share at an exercise price of $0.01 per Pre-Funded Warrant and may be exercised at any time after closing until all of the Pre-Funded Warrants are exercised in full. The Pre-Funded Units are being offered and sold to purchasers whose purchase of Units in the offering would otherwise result in the purchaser, together with its affiliates and certain related parties, beneficially owning more than 4.99% (or, at the election of such purchaser, 9.99%) of our outstanding common shares immediately following the consummation of the October 2018 Offering. The closing of the October 2018 Offering is expected to take place on or about October 16, 2018, subject to the satisfaction of customary closing conditions. In October 2018, we announced that we had completed the clinical portion of our Category 2 and 3 human abuse liability studies for our Oxycodone ER product candidate to support its abuse-deterrent label claims for both the oral and intranasal route of administration. Bioanalytical samples and statistical analysis for such studies are pending. Results from the studies will be included in our response to the FDA Complete Response Letter which is due no later than February 28, 2019. As more fully described below, in October 2018, we announced that we received a letter from Nasdaq Listing Qualification notifying the Company that we had regained compliance with Nasdaq's minimum bid price requirement and that the Nasdaq Hearings Panel (the “Hearings Panel”) had granted our request for continued listing through October 17, 2018 while we work to regain compliance with Nasdaq's $2.5 million stockholders' equity continued listing requirement. In September 2018, we announced a one-for-ten share consolidation (the "reverse split"). At a special meeting of our shareholders held on August 15, 2018, our shareholders granted our Board of Directors discretionary authority to implement a consolidation of our issued and outstanding common shares on the basis of a consolidation ratio within a range from five (5) pre-consolidation common shares for one (1) post-consolidation common share to fifteen (15) pre-consolidation common shares for one (1) post-consolidation common share. The Board of Directors selected a share consolidation ratio of ten (10) pre-consolidation shares for one (1) post-consolidation common share. The reverse split was implemented in order to qualify for continued listing on Nasdaq, whereby we have to meet certain continued listing criteria, including a closing bid price of at least $1.00 for a minimum of 10 consecutive business days. On September 12, 2018, the Company filed articles of amendment which implemented the reverse split, and our shares began trading on each of The NASDAQ Capital Market ("Nasdaq") and the Toronto Stock exchange ("TSX") on a post-split basis under the Company's existing trade symbol "IPCI" at the market open on September 14, 2018. The reverse split reduced the number of outstanding common shares from approximately 43.5 million to approximately 4.35 million. In September 2018, we announced that we issued in a private placement financing (the ''Debenture Financing'') an unsecured convertible debenture in the principal amount of $0.5 million (the ''2018 Debenture''), which will mature September 1, 2020. 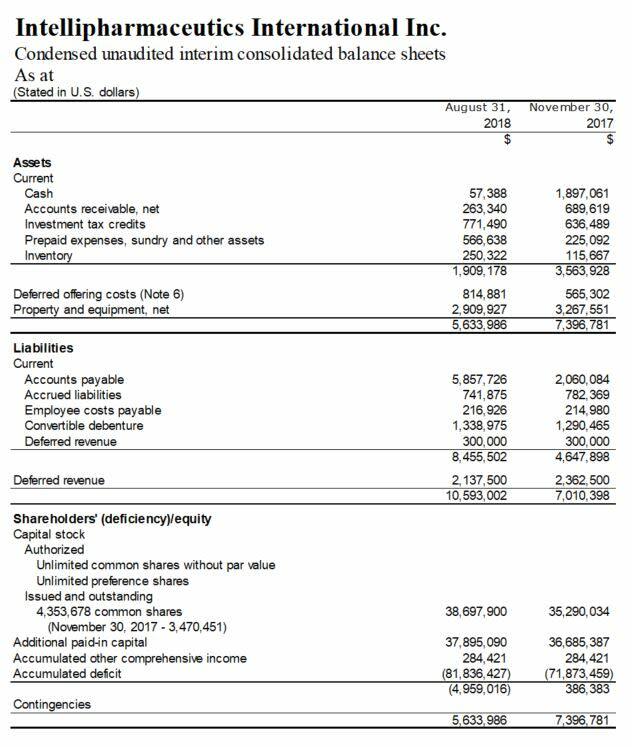 The 2018 Debenture bears interest at a rate of 10% per annum, payable monthly, is pre-payable at any time at the option of the Company, and is convertible at any time into common shares at a conversion price of $3.00 per common share at the option of the holder. The Debenture Financing was non-brokered and the net proceeds are to be used for working capital and general corporate purposes. In July 2018, we announced that infringement claims related to one of the six original patents included in the Purdue litigation (as described below) have been dismissed without prejudice. As previously announced, in April 2017, we received notice that Purdue Pharma L.P., Purdue Pharmaceuticals L.P., The P.F. Laboratories, Inc., Rhodes Technologies, and another party had commenced patent infringement proceedings against the Company in the U.S. District Court for the District of Delaware in respect of the Company's new drug application filing for Oxycodone ER. The parties to the case mutually agreed to dismiss the infringement claims related to the Grünenthal ‘060 patent (which is one of the six patents included in the original litigation case). Infringement claims related to this patent have been dismissed without prejudice. On October 4, 2018, the parties to the case mutually agreed to postpone the scheduled court date pending a case status conference scheduled for December 17, 2018. There can be no assurance that our products will be successfully commercialized or produce significant revenues for us. Also, there can be no assurance that we will not be required to conduct further studies for our Oxycodone ER product candidate, that the FDA will approve any of our requested abuse-deterrence label claims or that the FDA will ultimately approve the NDA for the sale of our Oxycodone ER product in the U.S. market, or that it will ever be successfully commercialized, that we will be successful in submitting any additional ANDAs or NDAs with the FDA or ANDSs with Health Canada, that the FDA or Health Canada will approve any of our current or future product candidates for sale in the U.S. market and Canadian market, or that they will ever be successfully commercialized and produce significant revenue for us. While we are currently not in compliance with the requirements for the continued listing of our common shares on Nasdaq, as described below, we have until October 17, 2018 to satisfy those requirements. The October 2018 Offering and our recent reverse split are important parts of our plan to regain compliance with Nasdaq's requirements for the continued listing of our common shares. In September 2017, we were notified by Nasdaq that we were not in compliance with the minimum market value of listed securities required for continued listing on Nasdaq. Nasdaq Listing Rule 5550(b) requires listed securities to maintain a minimum market value of $35.0 million, among other alternatives, including minimum stockholders' equity of $2.5 million. A failure to meet the minimum market value requirement exists if the deficiency continues for a period of 30 consecutive business days. Based on the market value of our common shares for the 30 consecutive business days from August 8, 2017, we did not satisfy the minimum market value of listed securities requirement. By rule, we were provided 180 calendar days, or until March 19, 2018, to regain compliance with that requirement. To regain compliance, our common shares were required to have a market value of at least $35.0 million for a minimum of 10 consecutive business days prior to March 19, 2018, which they did not. In the alternative, if the minimum market value requirement for continued listing is not met, an issuer may maintain continued listing under Nasdaq Listing Rule 5550(b) if it has stockholders' equity of at least $2.5 million. On April 20, 2018, we received notice that the Nasdaq Listings Qualification staff (the "Nasdaq Staff") had determined to delist our common shares as a result of our failure to meet either the minimum market value of listed securities requirement or the minimum stockholders' equity requirement for continued listing. However, any delisting action by the Nasdaq Staff was stayed pending the ultimate conclusion of the Company's hearing before the Pane. In addition to not meeting the minimum market value of listed securities or minimum stockholders' equity requirements, we were separately notified in December 2017 that our common shares no longer satisfied the minimum $1.00 per share bid requirement under Nasdaq Listing Rule 5550(a)(2). We attended a hearing before the Hearings Panel on May 17, 2018, and subsequently received formal notice that the Hearings Panel had granted our request for continued listing provided that by September 28, 2018, we (i) comply with Nasdaq's $1.00 bid price requirement by having a closing bid price of over $1.00 for ten consecutive trading days, (ii) have stockholders' equity position of over $2.5 million, and (iii) provide the Hearings Panel with updated financial projections demonstrating our ability to maintain compliance with the stockholders' equity rule for the coming year. Following receipt of shareholder approval for a reverse stock split (known as a share consolidation under Canadian law) at our August 15, 2018 shareholders meeting, on September 12, 2018, we filed articles of amendment to effectuate a 1-for-10 reverse split, and our common shares began trading on each of Nasdaq and the Toronto Stock Exchange on a post-reverse split basis on September 14, 2018. As a result of the closing bid price of the Company's common shares exceeding $1.00 for the period from September 14, 2018 to September 27, 2018, the Company received a letter from Nasdaq Listing Qualification notifying the Company that it had regained compliance with Nasdaq's minimum bid price requirement. On September 29, 2018, the Company was advised that the Hearings Panel granted an extension through October 17, 2018 for us to regain compliance with Nasdaq's stockholders' equity continued listing requirement. There is no assurance that we will be able to regain compliance with Nasdaq's stockholders' equity requirements, or if we do, that we will be able to maintain compliance with Nasdaq's listing requirements. There can be no assurance that we will be able to regain or maintain compliance with the Nasdaq listing requirements or, if we do regain compliance, that we will be able to maintain compliance over the long term. The Company recorded net loss for the three months ended August 31, 2018 of $3,954,104 or $0.91 per common share, compared with a net loss of $2,550,314 or $0.83 per common share for the three months ended August 31, 2017. In the three months ended August 31, 2018, the net loss is primarily attributed to the lower licensing revenues from commercial sales of generic Focalin XR®, combined with increased third party R&D expenses and patent litigation expenses. In the three months ended August 31, 2017, the lower net loss was primarily attributed to lower third-party R&D expenditures, as well as higher licensing revenue from commercial sales of generic Focalin XR® and generic Seroquel XR® in the third quarter of 2017. The Company recorded revenues of $413,555 for the three months ended August 31, 2018 versus $1,189,739 for the three months ended August 31, 2017. Revenues consisted primarily of licensing revenues from commercial sales of the 5,10, 15, 20, 25, 30, 35 and 40 mg strengths of our generic Focalin XR® under the Par agreement. Pursuant to the Par agreement, we receive quarterly profit share payments on Par's U.S. sales of generic Focalin XR®. The decrease in revenues in the three months ended August 31, 2018 is primarily due to considerably lower profit share payments from sales of generic Focalin XR® capsules in the U.S. The Company's revenues on the 25 and 35 mg strengths of generic Focalin XR® showed some decline commencing July 2017 when their 6 month exclusivity expired, but subsequently levelled off for the balance of 2017. Profit share payments from the various strengths of generic Focalin XR® for the third quarter of 2018 show continuation of competitive pressures on price. While gross sales improved slightly in the second quarter of 2018, results continue to be impacted by significant gross-to-net deductions such as chargebacks, rebates and price adjustments. The 15, 25 and 30 mg strengths provide the majority of the product's gross sales, however, the other strengths are not providing material contribution to gross sales or net profits expected since their launch in May and November of last year. Pricing pressures on all strengths have meant that chargebacks, rebates and pricing adjustments continue to remain high and net profitability of the product has suffered as a result. We currently expect revenues from this product to show incremental improvement over the longer term, however, pricing adjustments and similar deductions will likely continue to negatively impact results for the next several quarters. Revenues from generic Seroquel XR® showed some incremental improvement in the third quarter of 2018, however, sales volumes are still well below original expectations and market share gains have proved difficult to achieve. Sales and net profits are improving incrementally, however, any significant market share gains are expected to take considerably more time to achieve, if at all. Expenditures for R&D for the three months ended August 31, 2018 were higher by $1,025,417 compared to the three months ended August 31, 2017. The increase was primarily due to an increase in third party R&D expenditures as a result of ongoing clinical trials for Oxycodone ER and higher patent litigation expense. Selling, general and administrative expenses were $792,379 for the three months ended August 31, 2018 in comparison to $756,635 for the three months ended August 31, 2017, an increase of $35,744. The increase is primarily due to higher administrative costs related to professional fees, offset by a decrease in wages and benefits and marketing costs. 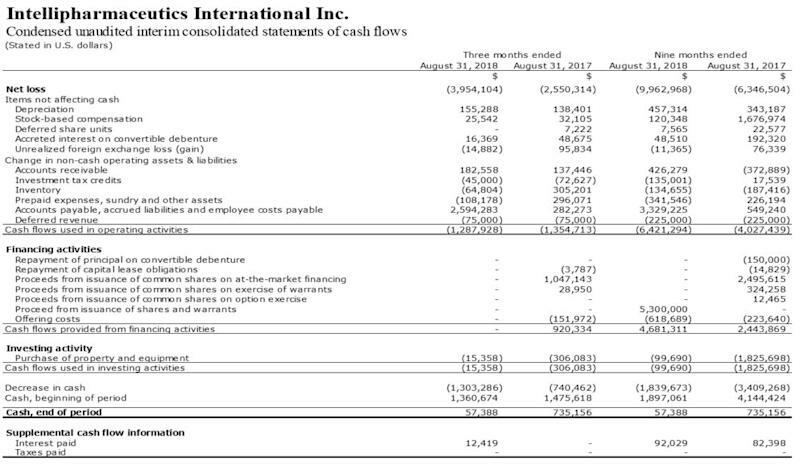 The Company had cash of $57,388 as at August 31, 2018 compared to $1,360,674 as at May 31, 2018. The decrease in cash during the three months ended August 31, 2018 was mainly a result of expenditures for R&D related to our ongoing product development activities for Oxycodone ER and selling, general, and administrative expenses. The decrease in cash during the three months ended August 31, 2017 was mainly a result of our ongoing expenditures in R&D and selling, general, and administrative expenses, which includes increased consulting fees incurred to prepare for the July 26, 2017 FDA Advisory Committee meeting and an increase in purchases of plant and production equipment to support our generic Seroquel XR® launch, which were only partially offset by higher cash receipts from commercialized sales of our generic Focalin XR® and cash receipts provided from financing activities derived from common share sales under the Company's at-the-market offering program. As of October 15, 2018, our cash balance was $0.1 million. We expect the October 2018 Offering to close October 16, 2018. The net proceeds to us from the offering is anticipated to be approximately $11.1 million after deducting underwriting discounts and commissions and estimated offering expenses payable by us (or $12.9 million if the underwriter's option to purchase additional shares and/or warrants is exercised in full). We currently intend to use the net proceeds from this offering for general corporate purposes, which may include working capital, capital expenditures, research and development, accounts payable, and other commercial expenditures. The Company may need to obtain additional funding as we further the development of our product candidates. Other potential sources of capital may include payments from licensing agreements, cost savings associated with managing operating expense levels, equity and/or debt financings and/or new strategic partnership agreements which fund some or all costs of product development. We intend to utilize the equity markets to bridge any funding shortfall and to provide capital to continue to advance our most promising product candidates. Our future operations are highly dependent upon our ability to source additional capital to support advancing our product pipeline through continued R&D activities and to fund any significant expansion of our operations. At present, we are working principally on our Oxycodone ER 505(b)(2), PODRASTM technology, additional 505(b)(2) product candidates for development in various indication areas and selected generic product candidate development projects. Our development of Oxycodone ER will require significant expenditures, including costs to defend against the Purdue litigation. For our RegabatinTM XR 505(b)(2) product candidate, Phase III clinical trials can be capital intensive, and will only be undertaken consistent with the availability of funds and a prudent cash management strategy. We anticipate some investment in fixed assets and equipment over the next several months, the extent of which will depend on cash availability. There can be no assurance that our products will be successfully commercialized or produce significant revenues for us. Also, there can be no assurance that we will not be required to conduct further studies for our Oxycodone ER product candidate, that the FDA will approve any of our requested abuse-deterrence label claims or that the FDA will ultimately approve the NDA for the sale of our Oxycodone ER product candidate in the U.S. market, or that it will ever be successfully commercialized, that we will be successful in submitting any additional ANDAs or NDAs with the FDA or Abbreviated New Drug Submissions with Health Canada, that the FDA or Health Canada will approve any of our current or future product candidates for sale in the U.S. market and Canadian market, or that they will ever be successfully commercialized and produce significant revenue for us. Intellipharmaceutics International Inc. is a pharmaceutical company specializing in the research, development and manufacture of novel and generic controlled-release and targeted-release oral solid dosage drugs. The Company's patented Hypermatrix™ technology is a multidimensional controlled-release drug delivery platform that can be applied to a wide range of existing and new pharmaceuticals. Intellipharmaceutics has developed several drug delivery systems based on this technology platform, with a pipeline of products (some of which have received FDA approval) in various stages of development. The Company has ANDA and NDA 505(b)(2) drug product candidates in its development pipeline. These include the Oxycodone ER abuse deterrent oxycodone formulation based on its proprietary nPODDDS™ novel Point Of Divergence Drug Delivery System (for which an NDA has been filed with the FDA), and Regabatin™ XR (pregabalin extended-release capsules). Certain statements in this document constitute "forward-looking statements" within the meaning of the United States Private Securities Litigation Reform Act of 1995 and/or "forward-looking information" under the Securities Act (Ontario). These statements include, without limitation, statements expressed or implied regarding our expectations regarding our recent reverse stock split, our plans, goals and milestones, status of developments or expenditures relating to our business, plans to fund our current activities, and statements concerning our partnering activities, health regulatory submissions, strategy, future operations, future financial position, future sales, revenues and profitability, projected costs and market penetration and risks or uncertainties related to our ability to implement our plan of compliance with the Nasdaq continued listing standards. In some cases, you can identify forward-looking statements by terminology such as "appear," "unlikely," "target," "may," "will," "should," "expects," "plans," "plans to," "anticipates," "believes," "estimates," "predicts," "confident," "prospects," "potential," "continue," "intends," "look forward," "could," "would," "projected," "goals," "set to," "seeking" or the negative of such terms or other comparable terminology. We made a number of assumptions in the preparation of our forward-looking statements. You should not place undue reliance on our forward-looking statements, which are subject to a multitude of known and unknown risks and uncertainties that could cause actual results, future circumstances or events to differ materially from those stated in or implied by the forward-looking statements. Risks, uncertainties and other factors that could affect our actual results include, but are not limited to, , the effects of general economic conditions, securing and maintaining corporate alliances, our estimates regarding our capital requirements, and the effect of capital market conditions and other factors, including the current status of our product development programs, on capital availability, the estimated proceeds (and the expected use of any proceeds) we may receive from any offering of our securities, the potential dilutive effects of any future financing, potential liability from and costs of defending pending or future litigation, our ability to maintain compliance with the continued listing requirements of the principal markets on which our securities are traded, including risks or uncertainties related to our ability to implement our plan to comply with the Nasdaq continued listing standards, our programs regarding research, development and commercialization of our product candidates, the timing of such programs, the timing, costs and uncertainties regarding obtaining regulatory approvals to market our product candidates and the difficulty in predicting the timing and results of any product launches, the timing and amount of profit-share payments from our commercial partners, and the timing and amount of any available investment tax credits, the actual or perceived benefits to users of our drug delivery technologies, products and product candidates as compared to others, our ability to establish and maintain valid and enforceable intellectual property rights in our drug delivery technologies, products and product candidates, the scope of protection provided by intellectual property rights for our drug delivery technologies, products and product candidates, recent and future legal developments in the United States and elsewhere that could make it more difficult and costly for us to obtain regulatory approvals for our product candidates and negatively affect the prices we may charge, increased public awareness and government scrutiny of the problems associated with the potential for abuse of opioid based medications, pursuing growth through international operations could strain our resources, our limited manufacturing, sales, marketing or distribution capability and our reliance on third parties for such, the actual size of the potential markets for any of our products and product candidates compared to our market estimates, our selection and licensing of products and product candidates, our ability to attract distributors and/or commercial partners with the ability to fund patent litigation and with acceptable product development, regulatory and commercialization expertise and the benefits to be derived from such collaborative efforts, sources of revenues and anticipated revenues, including contributions from distributors and commercial partners, product sales, license agreements and other collaborative efforts for the development and commercialization of product candidates, our ability to create an effective direct sales and marketing infrastructure for products we elect to market and sell directly, the rate and degree of market acceptance of our products, delays in product approvals that may be caused by changing regulatory requirements, the difficulty in predicting the timing of regulatory approval and launch of competitive products, the difficulty in predicting the impact of competitive products on volume, pricing, rebates and other allowances, the number of competitive product entries, and the nature and extent of any aggressive pricing and rebate activities that may follow, the inability to forecast wholesaler demand and/or wholesaler buying patterns, seasonal fluctuations in the number of prescriptions written for our generic Focalin XR® capsules and our generic Seroquel XR® tablets which may produce substantial fluctuations in revenue, the timing and amount of insurance reimbursement regarding our products, changes in laws and regulations affecting the conditions required by the FDA for approval, testing and labeling of drugs including abuse or overdose deterrent properties, and changes affecting how opioids are regulated and prescribed by physicians, changes in laws and regulations, including Medicare and Medicaid, affecting among other things, pricing and reimbursement of pharmaceutical products, the effect of recently-enacted changes in U.S. federal income tax laws, including but not limited to, limitations on the deductibility of business interest, limitations on the use of net operating losses and application of the base erosion minimum tax, on our U.S. corporate income tax burden, the success and pricing of other competing therapies that may become available, our ability to retain and hire qualified employees, the availability and pricing of third-party sourced products and materials, challenges related to the development, commercialization, technology transfer, scale-up, and/or process validation of manufacturing processes for our products or product candidates, the manufacturing capacity of third-party manufacturers that we may use for our products, potential product liability risks, the recoverability of the cost of any pre-launch inventory, should a planned product launch encounter a denial or delay of approval by regulatory bodies, a delay in commercialization, or other potential issues, the successful compliance with FDA, Health Canada and other governmental regulations applicable to us and our third party manufacturers' facilities, products and/or businesses, our reliance on commercial partners, and any future commercial partners, to market and commercialize our products and, if approved, our product candidates, difficulties, delays or changes in the FDA approval process or test criteria for ANDAs and NDAs, challenges in securing final FDA approval for our product candidates, including our oxycodone hydrochloride extended release tablets product candidate, in particular, if a patent infringement suit is filed against us with respect to any particular product candidates (such as in the case of Oxycodone ER), which could delay the FDA's final approval of such product candidates, healthcare reform measures that could hinder or prevent the commercial success of our products and product candidates, the FDA may not approve requested product labeling for our product candidate(s) having abuse-deterrent properties and targeting common forms of abuse (oral, intra-nasal and intravenous), risks associated with cyber-security and the potential for vulnerability of our digital information or the digital information of a current and/or future drug development or commercialization partner of ours, and risks arising from the ability and willingness of our third-party commercialization partners to provide documentation that may be required to support information on revenues earned by us from those commercialization partners. Additional risks and uncertainties relating to us and our business can be found in the "Risk Factors" section of our latest annual information form, our latest Form 20-F, and our latest Form F-3 (including any documents forming a part thereof or incorporated by reference therein), as well as in our reports, public disclosure documents and other filings with the securities commissions and other regulatory bodies in Canada and the U.S., which are available on www.sedar.com and www.sec.gov. The forward-looking statements reflect our current views with respect to future events and are based on what we believe are reasonable assumptions as of the date of this document and we disclaim any intention and have no obligation or responsibility, except as required by law, to update or revise any forward-looking statements, whether as a result of new information, future events or otherwise. 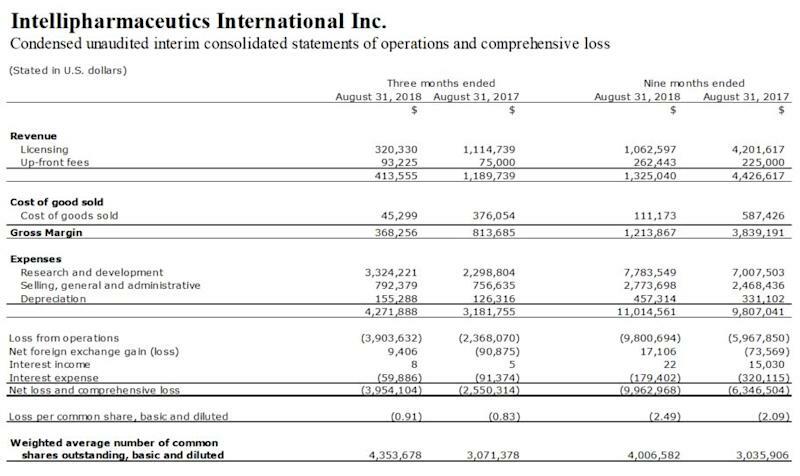 The condensed unaudited interim consolidated financial statements, accompanying notes to the condensed unaudited interim consolidated financial statements, and Management Discussion and Analysis for the three and nine months ended August 31, 2018 will be accessible on Intellipharmaceutics' website at www.intellipharmaceutics.com and will be available on SEDAR and EDGAR.